Scan mode allows a PosiTector 6000 Advanced gage user to take multiple readings in rapid succession without lifting the probe. Note: All PosiTector 6000 probes with serial numbers greater than 305,600 feature enhanced measurement speeds. In normal operation, these probes will take over 60 readings per minute. Setting the gage to Fast mode increases the measurement speed even further to over 90 readings per minute. To quickly analyze a large area, Scan mode now takes over 180 readings per minute while the probe is held on the coated surface. PosiTector 6000 probes marked with a serial number less than 305,600 will take approximately 120 readings per minute in Scan mode. Normal Scan - take continuous readings without lifting the probe. Statistics Scan - take continuous readings and record average, standard deviation, min/max thickness and number of readings while scanning. Limited Count Avg. Scan - take continuous readings up to a user-specified count. The gage displays and records the average of the readings. 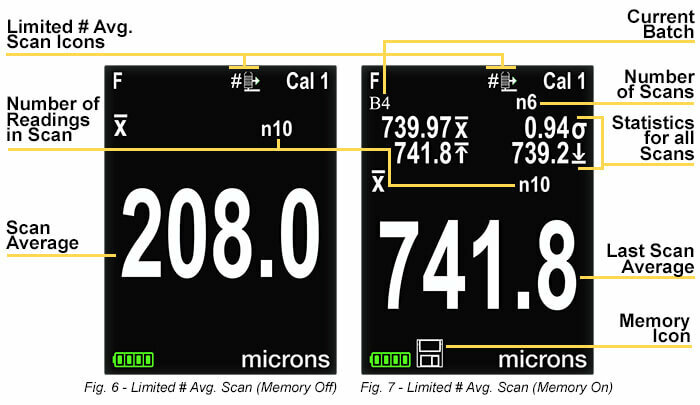 Note: PosiTector Advanced gage bodies (S/N 730,000+) are compatible with the new scan modes. Gage bodies may require the user to perform a firmware update online. To minimize probe wear when performing a scan, DeFelsko recommends that conventional PosiTector 6000 probes be used only on smooth coatings. For rough coatings, the PosiTector 6000 FXS and FHXS Xtreme probes feature extended wear faces. 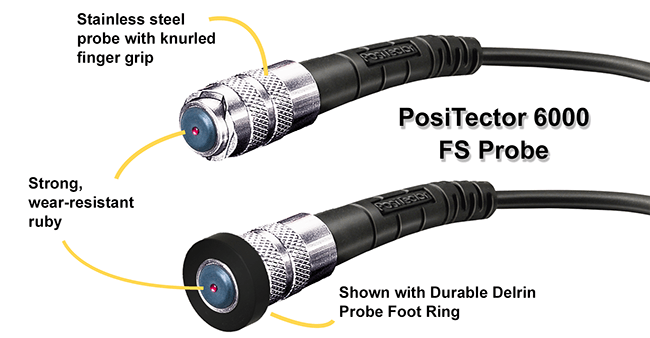 When measuring with PosiTector 6000 “regular” cabled probes (6000 FS, FXS, FTS, NS, FNS and FNDS), the coating is contacted by the polished wear-resistant ruby, and the stainless-steel finger grip. Optional Delrin Probe Foot Rings allow the probe to easily slide while scanning. (Fig. 1). To access the three different Scan modes, enter the PosiTector menu, go to "Setup" and select the "Scan" option. The Scan SETUP sub-menu displays the three different modes. Note: Only Normal Scan can be used in combination with a PosiTector Advanced gage's PA 2 mode. Normal Scan is also ideal for use in combination with the gage's 90/10, Statistics and HiLo Alarm operating modes. The PosiTector 6000 probe will measure continuously and display each reading while placed on the coated surface (Fig.2). When in Memory mode, each reading is stored in gage memory (Fig.3). When using Normal Scan mode simultaneously with PA 2 mode, the probe stops measuring when the desired number of readings per spot have been taken. When the probe is lifted, the next spot is automatically selected. The probe will measure continuously and display a running average while placed on the coated surface. When lifted from the surface, statistics comprising the Average Number of readings, Maximum, Minimum and Standard Deviation are displayed (Fig.4). 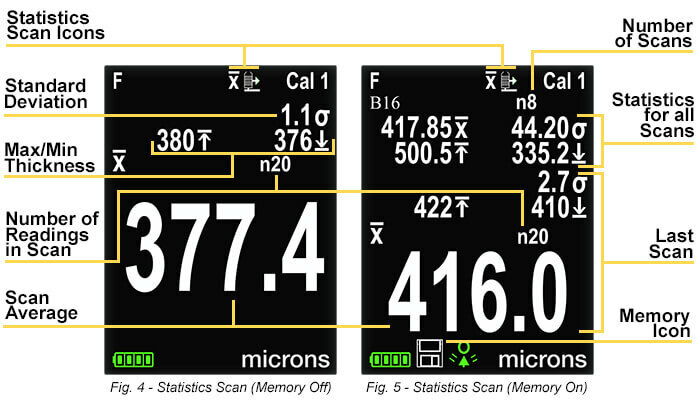 When in Memory mode, a scan dataset consisting of these statistics will be stored into gage memory for each set of readings, and statistics based on the average for each dataset are displayed (Fig.5). Individual readings are not displayed or saved into memory. Before measurement, the desired number of readings is selected by the user. The probe will measure continuously and display a running average while placed on the coated surface, but will stop taking readings when either (a) the desired number of readings is reached, or (b) the probe is lifted from the coated surface. After each scan, the average is displayed (Fig.6). 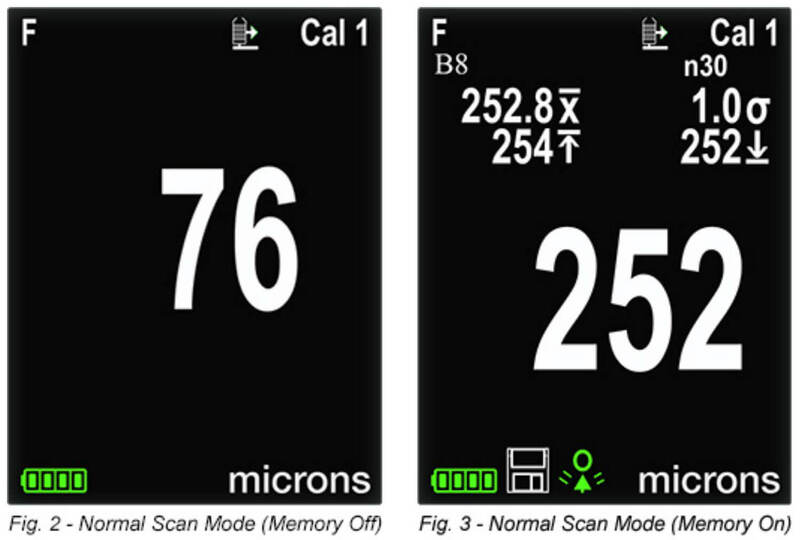 When in Memory mode, only this average is stored into gage memory for each scan, and statistics based on these averages are displayed (Fig.7). Individual readings are not displayed or saved into memory.